Avocado is one of the most common fruits used in sushi. 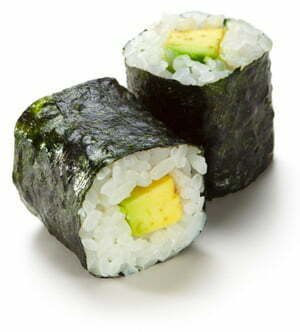 It is cholesterol free, and blends perfectly with the look and feel of the sushi roll. Because of its natural “fatty” taste and feel, the avocado is an ideal substitute for the raw fish commonly used in sushi. The best kind of avocado to use in sushi is, in our opinion, is the Hass avocado. You can recognise a Hass avocado by its pebbly dark green skin. Peel the skin, and remove the seed. For sushi filling: cut the avocado into 1-2cm thin slices. Use a peeler to peel very thin slices of avocado. Place the peels on top of an inside-out sushi roll. Use the bamboo mat to press the peels firmly to the roll.